Here you can listen to your voicemail and archive or delete your messages. Click to Open Menu and change folders. Click to Archive selected Voicemail messages, any Archived messages will appear in Archived Folder. Click to Delete selected Voicemail messages, any deleted messages will appear in Deleted Folder. Click Gear Icon to open additional options. Opens Voicemail announcement menu to change messages played to caller. Opens Remote access menu to access voicemail from outside VoIPstudio Network. Click play button to listen to message via Browser or click Save button to download message to local device. To access your voicemail from VoIPstudio phone please dial #445 - you will have the following options. 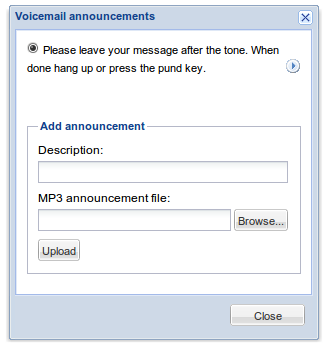 To change your voicemail announcement click gear icon in top right corner of Voicemail panel - see (2) in the figure 5.1 above - and select Announcements from the menu. Here you can upload your own MP3 file which will be used as your custom announcement. Figure 5.3 Voicemail remote access. 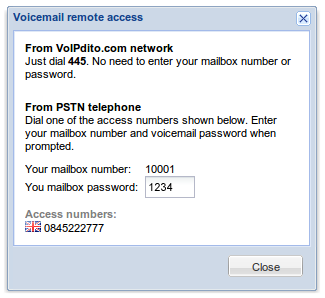 To change your voicemail password (required for remote access to your messages) click gear icon in top right corner of Voicemail panel - see (2) in the figure 5.1 above - and select Remote access from the menu. Here you can change your four digits long password.